I got a new toy recently. In the late 90s, when I was in high school, I had an Epiphone Sheraton II. Who knows how I paid for it at the time, because it would have been more than $500. It’s like a Gibson ES-335, a really common blues guitar. I’ve been missing it for quite some time ever since I sold it while we were saving up for the house. Then I ran across this one on Craigslist, played it, and picked it up used from a guy up near Bel Air. 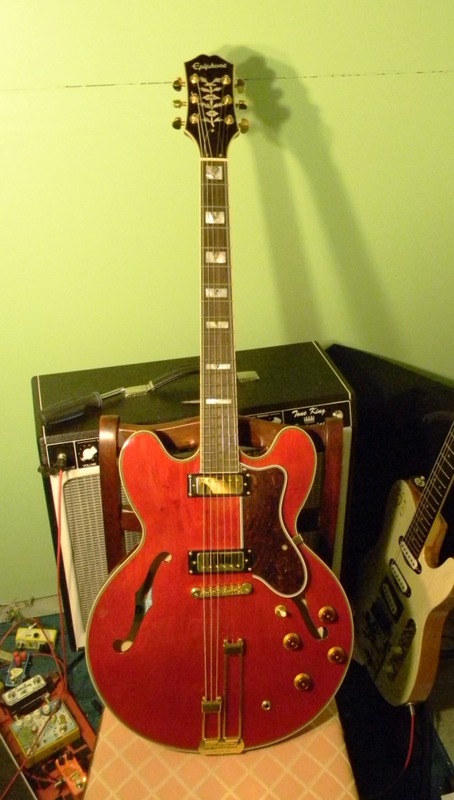 It’s a reproduction of a 1962 Epiphone model, and it has a different tailpiece and different pickups. It’s a much better guitar than the one I sold, but that’s not really what this post is about. One of the reasons I was okay selling that other guitar, aside from wanting to buy a house and downsizing my “stuff,” was that I felt I had more or less moved past the kind of music that I used it for. I went from playing blues and 90s alt rock in high school to playing acoustic folk/Americana/bluegrass/old time almost exclusively, and by the time I formed up Midway Fair I was playing something more like alt-country and Celtic music. I have difficulty focusing on more than one thing and generally I’m pretentious, so my feeling that the blues was nothing but guitar wankery sort of took over. Most of the time it is. But that doesn’t mean I don’t like playing it, and ignoring that side of American music was and is, frankly, incredibly short-sighted of me, and I’d only really pull it out when it served as some sort of selling point (like describing the Midway Fair song “At the Dawn of the Day” as “blues + Celtic”). There’s an open mic I go to about once every month or two in Ellicott City, at a place called Bippys. It used to be the open mic at The Friendly Inn, but moved when that place stopped doing live music. Since I’ve been going there almost uninterrupted (except for living out of state) since 1997, I’ve been there longer than anyone by several years. It’s a lot of blues players, and a few classic rock players. Everyone is much older than me. And most of the time I end up playing by myself, playing music that they really aren’t there to hear. So last week, I took the new Sheraton out for its test run, and decided to whip out almost entirely new material. Paul Beckwith played bass with me, and Steve Hammond played drums. Great players — they can follow even stuff they’ve never heard. And I was forced to keep things simple. I think it went over better than any set I’ve played there, but I noticed that most of the simplest songs I played were “solo” tunes, and that many of them were, if not exactly blues, much more blues-based than songs I played with Midway Fair. And they were fun and comfortable in a way that a lot of the Midway Fair material often isn’t. So now I wonder. Was it the simplicity that made me think that, or is this my brain trying to tell me to keep it simple stupid? Sometimes, it just feels good to play stuff that’s different than you’ve been concentrating on…good for the creative juices, too. is that how you ended up playing the style you have now, something different? >is that how you ended up playing the style you have now, something different? I more or less usually play just what I enjoy listening to. And congrats on the Sheraton! Jon, what is that guitar you use for the pedal video demos? It sounds very nice. It’s the Don Quixotecaster. It’s at the bottom of the “Things I Make” page.